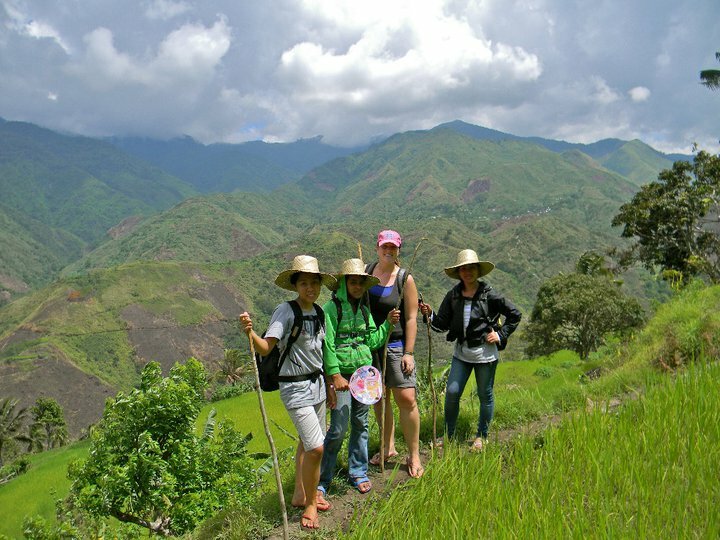 Anie, Rosela, Crystal and B-lyn hiking through the mountains. Our second outreach in upper Tinglayan was carried out with more smoothness and excellence than we could have dreamed. We spent five days hiking through five different Butbut villages that we had never visited before and we held outreaches in three of those villages. We were more excited than five year olds on Christmas morning as we set off on our adventure hiking through the mountains. That excitement turned into overwhelming joy with ecstatic smiles that grew bigger with every new village we entered. We were warmly welcomed in each village and were repeatedly thanked for coming to visit. Each outreach started with a game to get everyone laughing, worship and devotion, a health teaching, a yummy snack, and a prenatal to make sure all the mothers and babies were healthy. 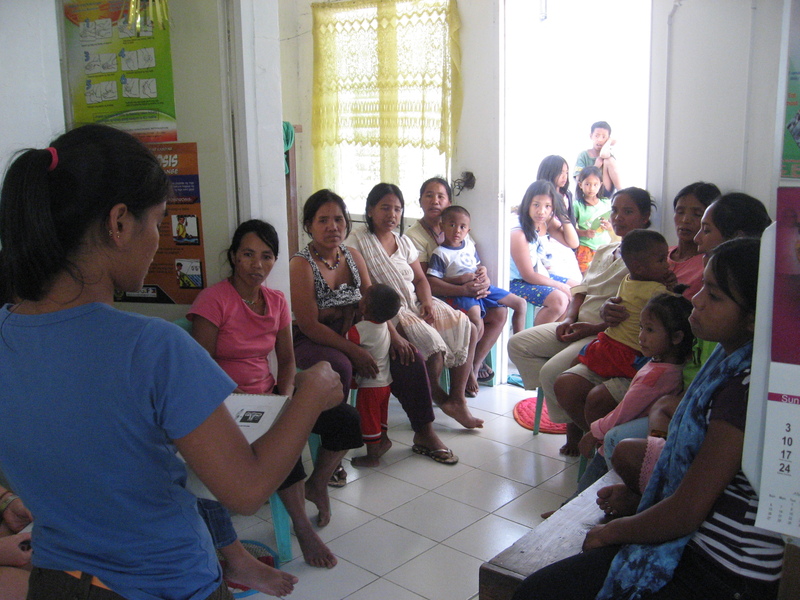 The midwife in the village of Loccong expressed gratitude for us coming to educate the women on the importance of vaccinations and taking vitamins; topics that she had struggled with teaching. We learned that even though each village has a midwife, oftentimes, the midwife is only trained in accessing risk factors such as checking a woman’s blood pressure but is not skilled in dealing with emergency situations such as resuscitation or stopping a hemorrhage. These skills are the difference between life and death for these women where a transport would involve an hour or more hike down the mountain, finding transportation that often does not exist at night, and driving for two more hours to the nearest hospital. In every village the women requested us to start another clinic closer to them. We are looking forward to continuing outreaches in the mountains. 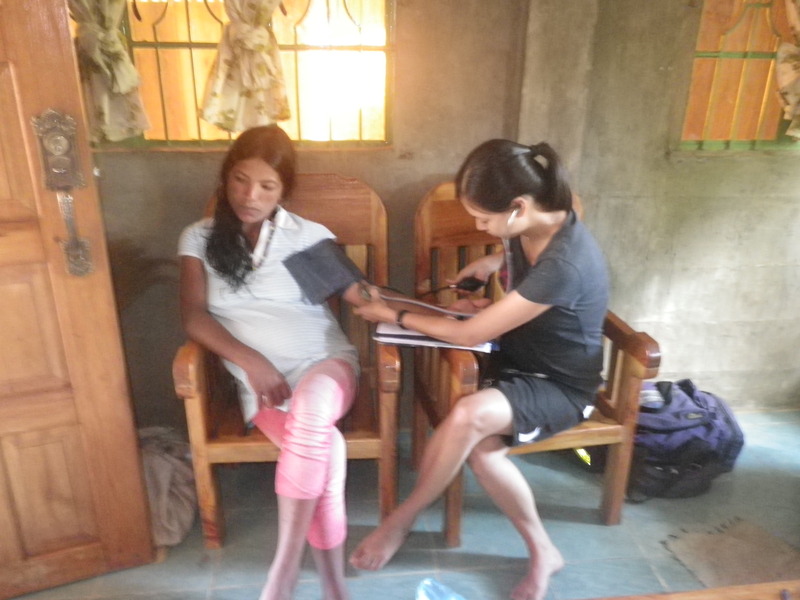 Richel checking blood pressures in the village of Butbut Proper. Almost to the village of Ngibat! The hike to the village of Ngibat while not physically exhausting was the scariest most adrenalin pumping hike of my life! It took us more than one hour of sliding down steep inclines to arrive there from the village of ButBut Proper. Most places was just enough room for one foot in front of the other with the chance of falling in a rice field on one side or a hundred foot drop off on the other. Just as we entered the village the skies opened and the rain came pouring down. I was grateful for God’s grace knowing had that rain came ten minutes earlier making that hike even more slippery I would have surely fallen off the mountain and died. 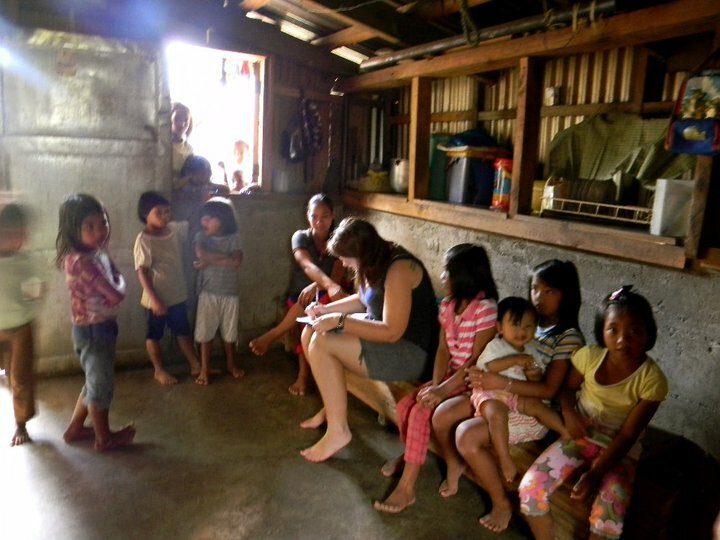 The next morning we started our outreach and learned that there were only two pregnant women in the whole village. Now I know what you are thinking all that preparation, insane hiking, another meal of sardines and sleeping on a hard floor for two lousy prenatals?!? But we were actually beeming with joy and probably even more enthusiastic with this outreach than all the others. The guys that had come with us had been playing the guitar and singing worship songs all morning as we prepared the snack of pancit. When the first woman came in I rushed to interview her. I found out this was *Marilou’s second pregnancy. Last year in her first pregnancy she had gone for all of her regular prenatal checkups. Everything had been normal throughout her pregnancy but when it came time to deliver the midwife was not in the village. Marilou labored for a day before deciding to go to the hospital. While in labor she hiked for over an hour down the mountain then took a jeep to the nearest hospital two hours away. By the time she arrived at the hospital her blood pressure had spiked to 160/100. She remained in labor another four days until a cesarean section was performed. Unfortunately after only 30 minutes of birth her baby quit fighting and went to be with Jesus. Due to her hypertension she hemorrhaged and was left to heal not only a great physical trauma but an emotional one as well. Obviously Marilou was extra concerned and nervous about this pregnancy. During the last part of the checkup I attempted to find the baby’s heartbeat even though it was still quite early. I prayed to find it knowing this would bring this anxious mother a lot of peace. I placed my hand on her tummy and moved the Doppler around listening to the static… the guys had started singing again and I found myself concentrating more on their words. What were they singing that had intrigued me so? Aaaah, ‘How Great Thou Art’ in Butbut! And then there it was… LubDubb LubDubb… We both giggled, smiled and teared up! Had she been the only pregnant lady in Ngibat that insane hike that left most of us with cuts and bruises would have still been worth it!!! Yes Lord how great, awesome and amazingly loving you are! We just arrived home from five days in the mountains. 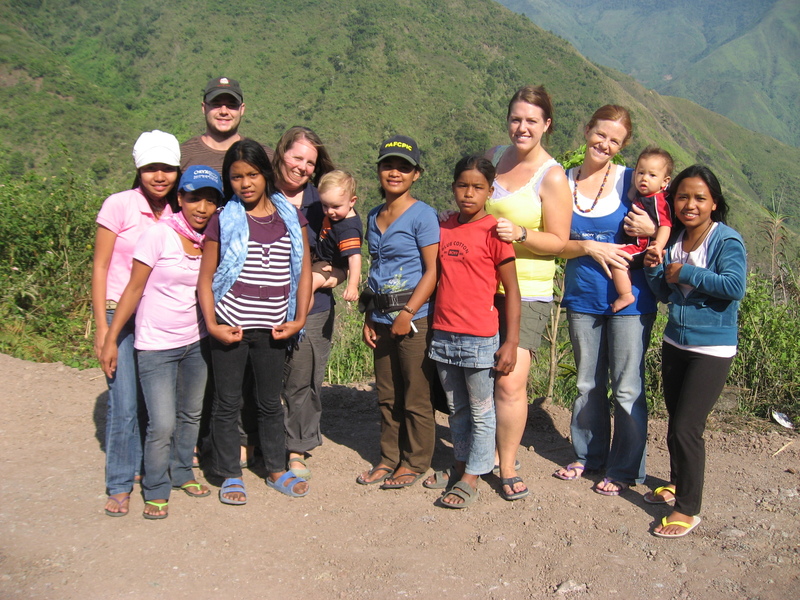 A team of 10 of us travelled to the villages of Bugnay and Buscalan to do health teachings and prenatal care. We had a wonderful reception in both villages. I was particularly happy that we had so many women attend our seminar in Buscalan as this was our first trip to this village for outreach. I was also so proud of Emmaus who hiked almost the whole way there! We also had the McCauley family join us. 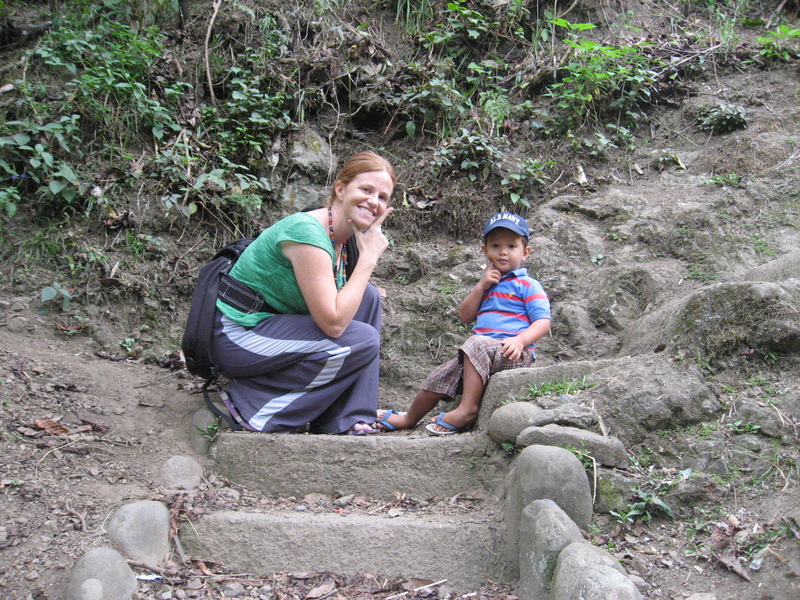 Melissa, Ben and little Samuel were a great asset to our team! 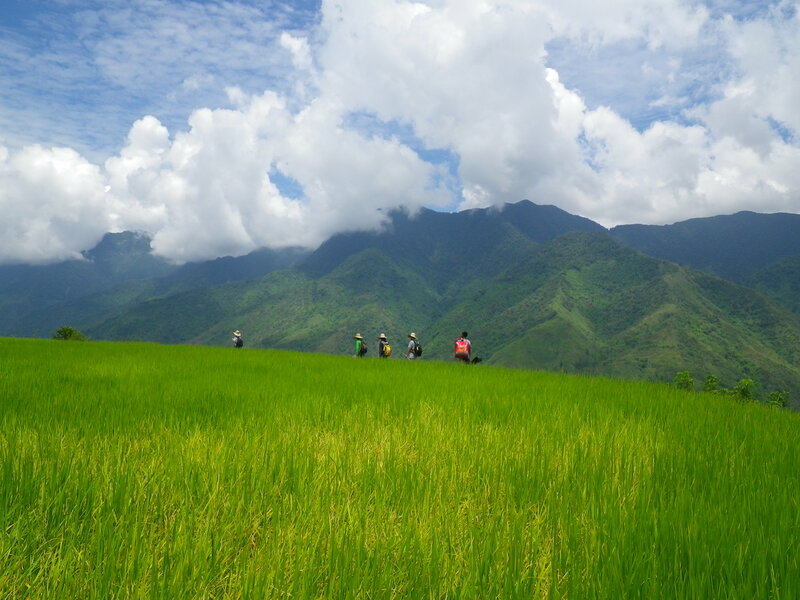 We will hike into the other three Butbut villages in May. These villages are more remote so we wont be bringing the kids with us! 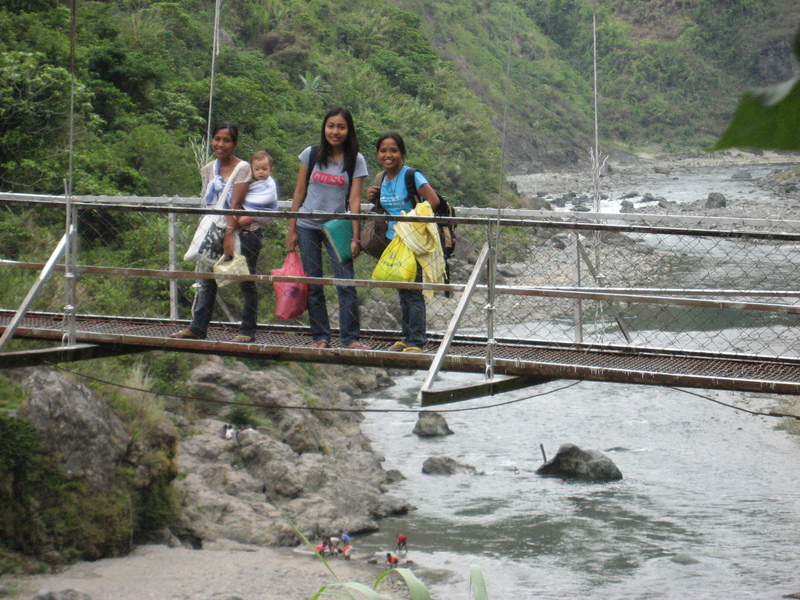 Crossing the bridge into Bugnay.